Dulce de Leche Cheesecake Bars are the perfect rich and creamy salty-sweet treat that’s easy to make and transport. Such a crowd pleaser! Taste: Rich and complex sweetness perfectly offset by delicate saltiness. Who doesn’t love the salty-sweet combination? Texture: Smooth creamy filling, soft sticky topping, and crunchy toothsome crust. Ease: If you have a food processor this recipe is a cinch. Cheesecake has a reputation for being difficult and demanding but cheesecake bars are so much easier to make and transport, and they taste just as great. Cons: I had to think for a while if there was anything bad about this recipe. I came up with one thing… and that was cost. It’s definitely not the cheapest recipe to make. Would I make this again? Yes, these would be great for a party. Dulce de leche, caramel, butterscotch. What is it about cooking sugar + milk or cream that makes it so unbelievably good?! We could examine the chemical reactions that occur when caramelization happens. But they’re so complex that it would take the fun and magic out of these deeply sweet and complex forms of edible liquid gold. It seems that salted caramel is everywhere these days, but what about Dulce de Leche?! In my book, it’s just as good as caramel. 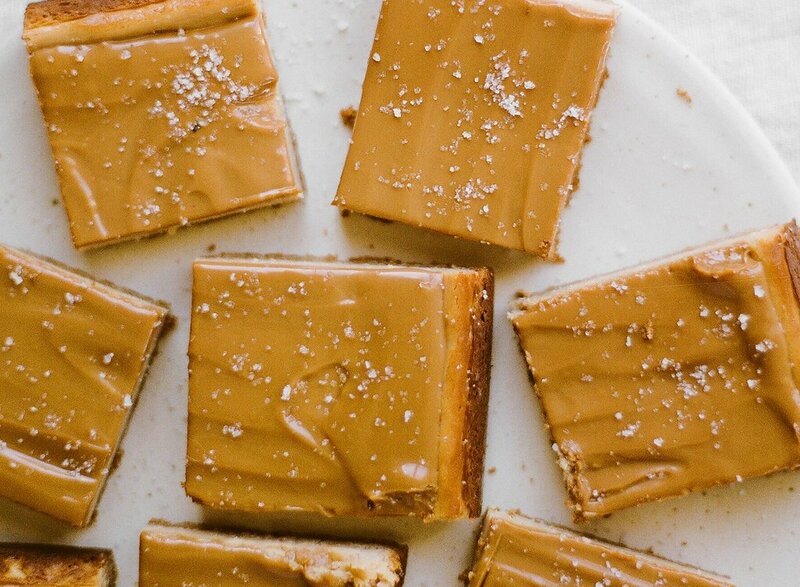 It perfectly complements the tang and touch of saltiness of these Dulce de Leche Cheesecake Bars. Plus, when you serve anything with Dulce de Leche to your friends, coworkers, or family, there’s always a touch of exoticness that makes it so easy to delight and impress. Pick up a jar of Dulce de Leche in the Latin food section of many grocery stores, or at most speciality or gourmet food stores. OR, make your own here. This recipe makes a 9 by 13-inch pan worth of bars, but they’re not super thick. That’s the way I prefer my cheesecake bars so they’re not overly rich and filling. Plus I like a good amount of crust to balance out the smoothness of the cream cheese. If you decide to whip up a batch of these Dulce de Leche Cheesecake Bars soon, don’t omit the sprinkling of fleur de sel! It would be criminal. If you can’t get fleur de sel, then try any flaky sea salt you can find. And if you do make and enjoy this recipe, be sure to snap a picture and share it on Instagram, tagging #handletheheat, so we can all see your creations! This post was originally published in 2010 and updated with new photos by Constance Higley and more recipe tips. Preheat the oven to 350°F. Line an 9 by 13-inch baking pan with foil, leaving an overhang. In the work bowl of a food processor, pulse the graham crackers and cinnamon until finely ground. Add the melted butter and pulse until moistened. Press the mixture into the bottom of the prepared pan. Bake for about 10 minutes, or until lightly golden brown and fragrant. Let cool. In the bowl of a food processor or stand mixer, blend the cream cheese and sugar in until smooth and creamy, scraping down the sides of bowl as needed. Add eggs one at a time, blending after each addition. Add dulce de leche and vanilla and blend until just combined. Spread batter evenly over cooled crust. Bake until just set in center and edges are puffed and slightly cracked, about 35 to 40 minutes. Transfer to rack to let cool completely. In a microwave-safe bowl, heat dulce de leche and 3 tablespoons cream in 10-second bursts, stirring between bursts, until melted and smooth. Add more cream by the teaspoon if needed to make pourable. Pour glaze over cooled cheesecake and spread evenly. Refrigerate until chilled, about 3 hours (glaze will not be firm). The cheesecake can be made and refrigerated 2 days ahead of time. Sprinkle bars with fleur de sel before serving. This looks amazing..I NEED to try this! These bars look STUNNING! Great photo. I'm bookmarking this recipe. TIP: For cheaper way to get fleur de sal, try getting some from the bulk section of your grocery store/mart for a much cheaper price. I got some for less than a dollar because I only use it as decoration on desserts like the one you've posted. YUM! So, now you have NO cons haha j/k. isn't it the greatest addition to baked goods? Dulce de leche is so good! these look devine. can't wait to make them! For a even “on demand” way to get dulce de leche… 1 can of condense milk in a crock pot filled with water. Remove the labels off the can. Add enough water to the crock put to cover 1 inch above the can. Cover and heat on low for 8hrs (I made this while I was at work). Remove the cans (carefully) Let cool. Open can and VIOLA!!! Carmel goodness. Dulce de leche when you need it. BE CAREFUL NOT TO EAT THE ENTIRE CAN YOURSELF! Enjoy! These look amazing. 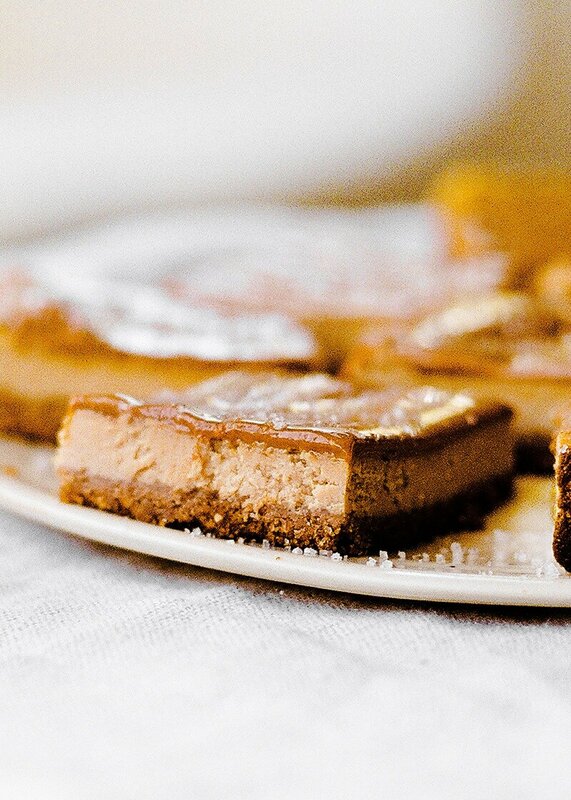 Cheesecake + Salt + Dulce de Leche… count me in! Yum! I don't know how I missed this in the back of the magazine – they look awesome! 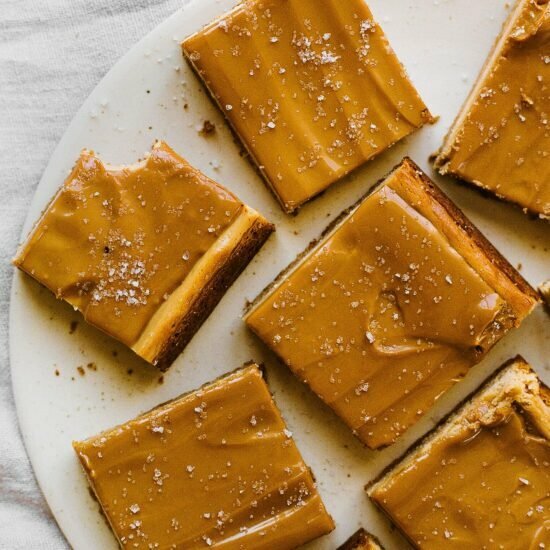 I simply love dulce de leche (it's not that expensive if you make it yourself from sweetened condense milk, btw) and these look so delicious! I saw this recipe in BA and made a mental note to try it. Then I forgot. Thanks for the reminder. Lovely photo, which is truly inspiring. When I look at the price of Fleur de sel, I hesitate. I have a lovely sea salt… decisions, decisions. I know that caramel and salt are an amazing combo. Great job! Ooh… Thanks for the reminder about this recipe. I saw it in BA and it looks great! I know I'd LOVE it! I was reading BA last week and came across this recipe. It sounded so good. . . But I'm currently staying at my grandparent's house. You just reminded me that once I get home, I have to bake these! Nestles makes a dulce de leche, too that is about $2 a can. I know that's beneath some people, but . . . I made these Sunday and they were delicious!! And I did spring for the salt from Williams Sonoma, too. This is a great recipe, and the photo is beautiful!! Tessa, I am not sure if you are updating every recipe you ever posted in the new format, but whatever it is, thank you so much for bringing up this one from 2010. I love it, it looks soooo good. Thank you! 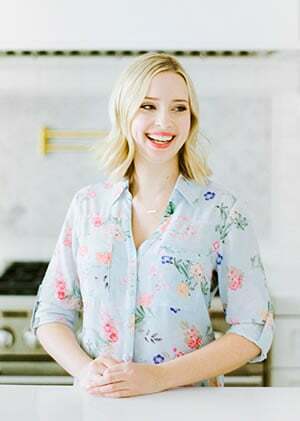 Hi Tessa, thank you for sharing this recipe. They must be delicious and I can’t wait to use your recipe.